HP 5800 switches offer an unmatched combination of Gigabit and 10-Gigabit Ethernet port density, high-availability architecture, and full Layer 2 and Layer 3 dual-stack IPv4 and IPv6 capabilities. 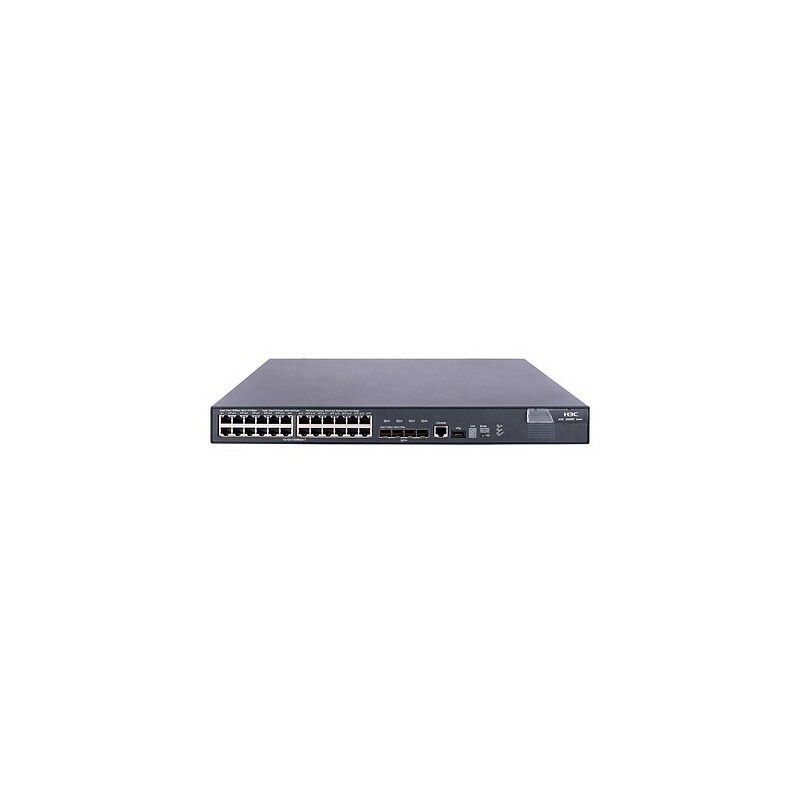 Besides wire-speed line-rate performance on all ports, the switches include patented Intelligent Resilient Framework (IRF) technology and Rapid Ring Protection Protocol (RRPP) that allow local or geographically distributed HP 5800 switches to be interconnected for higher resiliency and performance. Available in PoE and non-PoE models and 1 RU and 2 RU flex chassis configurations, HP 5800 switches are built on open standards and include an open application architecture (OAA) module slot that that enables flexible deployment options for new services. These versatile switches are ideal for use in the network core for a building or department, or as a high-performance switch in the convergence layer or network edge of enterprise campus networks. - Powerful QoS feature: creates traffic classes based on access control lists (ACLs), IEEE 802.1p precedence, IP, DSCP or Type of Service (ToS) precedence; supports filter, redirect, mirror, or remark; supports the following congestion actions: strict priority (SP) queuing, weighted round robin (WRR), weighted fair queuing (WFQ), weighted random early discard (WRED), weighted deficit round robin (WDRR), and SP+WDRR. Integrated network services: with support for open application architecture (OAA) modules, extends and integrates application capability into the network. Ring Resiliency Protection Protocol (RRPP): provides fast recovery for ring Ethernet-based topology; provides consistent application performance for applications such as VOIP. - Remote configuration and management: is available through a secure Web browser or a command-line interface (CLI). IEEE 802.1ab LLDP discovery: advertises and receives management information from adjacent devices on a network. USB support: File copy: allows users to copy switch files to and from a USB flash drive. DHCP options: - DNS Relay and SMTP Redirection. - DHCP: Server (RFC 2131), Client, and Option-82 Relay (RFC 3046). sFlow: provides scalable, ASIC-based, networkmonitoring and accounting; this allows network operators to gather a variety of sophisticated network statistics and information for capacity planning and real-time network monitoring purposes. - High-density port connectivity: supports up to 84 1-Gigabit ports per unit/612 per stack. Auto-MDIX: automatically adjusts for straight-through or crossover cables on all 10/100 ports. Jumbo frames: on Gigabit Ethernet and 10-Gigabit ports, they allow high-performance remote backup and disaster recovery services. IEEE 802.3af Power over Ethernet (PoE): provides up to 15.4 W per port to IEEE 802.3af-compliant PoE-powered devices such as IP phones, wireless access points, and security cameras. Medium Power over Ethernet (PoE): supports a medium Power over Ethernet (PoE) power supply, with each port providing up to 30 W of output power. - Hardware-based wire-speed access control lists (ACLs): feature-rich ACL implementation (TCAM based) helps ensure high levels of security and ease of administration without impacting network performance. Unique Flex-Chassis Architecture: supports the best of both fixed chassis and modular configurations. - Full-featured console: provides complete control of the switch with a familiar command-line interface (CLI). Web interface: allows configuration of the switch from any Web browser on the network. RMON and sFlow: provide advanced monitoring and reporting capabilities for statistics, history, alarms, and events. Multiple configuration files: allow multiple configuration files to be stored to a flash image. Troubleshooting: Ingress and egress port monitoring: enable network problem solving. Tracert and Ping: enable testing of network connectivity. Virtual Cable Tests: provide visibility to cable problems. - GARP VLAN Registration Protocol: allows automatic learning and dynamic assignment of VLANs. 32K MAC addresses: provide access to many Layer 2 devices. 4,094 port-based VLANs: provide security between workgroups. IEEE 802.1ad QinQ and Selective QinQ: increase the scalability of an Ethernet network by providing a hierarchical structure; connect multiple LANs on a high-speed campus or metro network. Gigabit Ethernet port aggregation: allows grouping of ports to increase overall data throughput to a remote device.